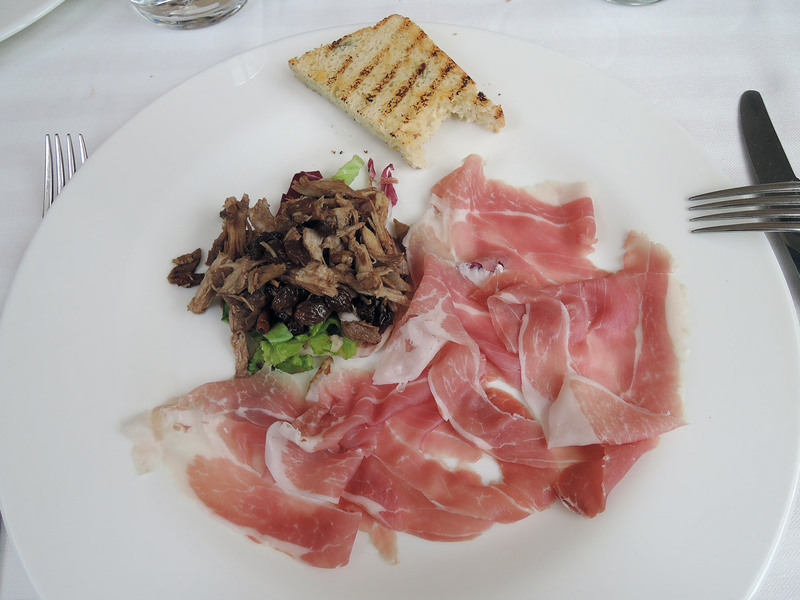 Prosciutto Veneto is a sweet delicacy. In Veneto the tradition of working the meat is ancient: since II century BC the Venetians sold to the Romans salami, sausages and smoked meats. 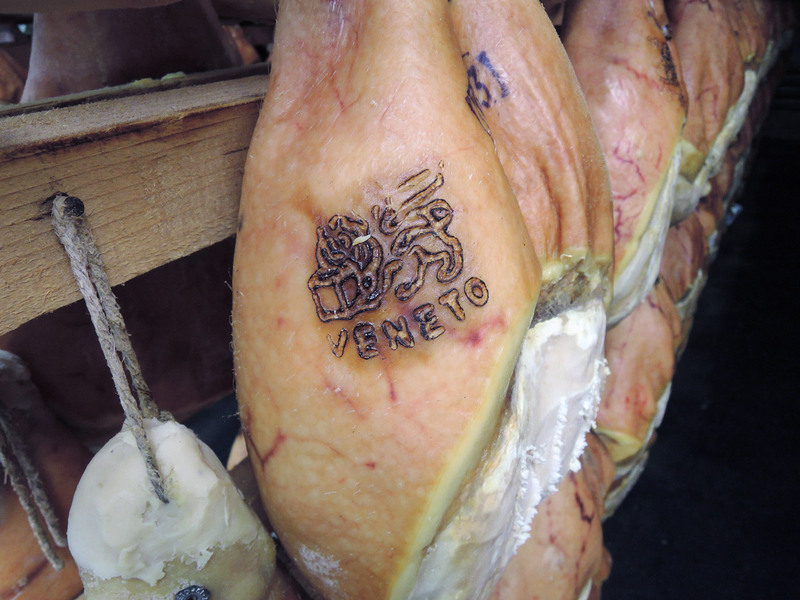 The Prosciutto Veneto Berico-Euganeo PDO (produced in fact in the area between the Berici Hills of Vicenza and the Euganean Hills of Padua) is a product of Venetian excellence. It is a prosciutto of the highest quality, with one flaw: a name too long and difficult to remember and to promote. The characteristics of this particular prosciutto are: pink reddish flesh with perfectly white fat parts, delicate and sweet aroma. The Protection Consortium was born in Montagnana in 1971 to protect the origin and quality of this product. The protected designation of origin (PDO) was awarded in 1996. To obtain this wonderful prosciutto, producers must follow a very complex and rigorous process. They start from a pork leg of a breed estabilished by the regulations (Duroc, Landrace and Large White), bred in farms where they live in welfare conditions and they are fed in a specific way. All the pigs were born and raised exclusively in the Italian regions specified in the procedural guideline (Veneto, Lombardia, Emilia Romagna and Lazio). On each leg it there is an engraving bearing the identification code of the breeder, the province and the month of birth of the piglet. This tattoo is a feature guaranteed only by the Italian production system. The prosciutto legs arrive at the Prosciuttificio, ham factory. The persons in charge examine the legs, select them by weight, submit them to an health control and, in the presence of an inspector, equip them with a seal which guarantees the origin and the exact date of arrival and salting. The legs must then stay in the salting area. Subsequently they pass into a machine that removes the salt and then softens the meat. Finally, the prosciutto is must stay in another room for about 4 months, until the salt, penetrating in the meat, will reach the heart of the leg. Then the prosciutto is washed 15 seconds in water at 40°C and placed in a drying area for a month. Later it is stuccoed with with fat and flour (to protect and maintain it) and it remains in the cellar for one year. On the 160th to 300th days an inspector of the Consortium performs a quality check. After the second check, the inspector marks the prosciutto with the Lion of St. Mark and the word Veneto, if the ham is judged suitable.